Per Nielsen live-plus-same-day ratings, the premiere of Fox’s limited series 24: Live Another Day delivered 8.08 million viewers and a 2.6 in the adults 18-49 demo, and while that paled in comparison to the 3.8 rating generated by the Season 8 opener, it was still a strong enough showing to make this one of the biggest launches of the 2013-14 season. The 24 refresh now stands as the season’s fourth highest-rated drama debut, trailing only Marvel’s Agents of S.H.I.E.L.D. (4.7), Resurrection/The Blacklist (3.8) and Fox’s own Sleepy Hollow (3.5). Throw comedy premieres into the mix, and Live Another Day claimed ninth place among all new series launches. Versus last week’s Bones-The Following battery, which averaged a 1.3 in the demo, Live Another Day delivered twice the target audience. Viewership was remarkably steady throughout the four half-hours, as the 18-49 needle didn’t budge from start to finish. 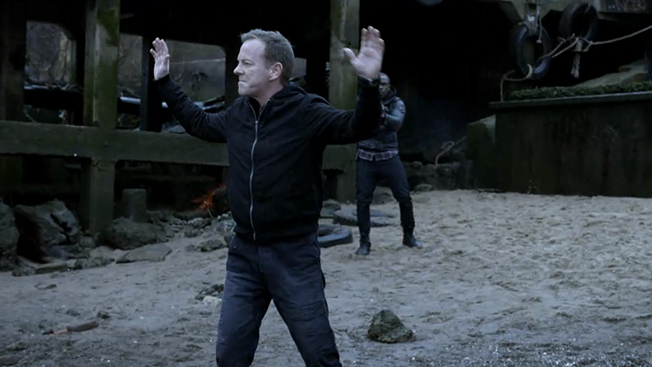 Comparisons to 24’s final run in 2010 are of a piece with the apples-to-hand-grenades model; for one, the final season of the Jack Bauer saga bowed just hours after an NFC Divisional Playoff between Dallas and Minnesota. (That the Vikings humiliated Tony Romo and the Cowboys by a score of 34-3 didn’t seem to scare off NFL fans; the blowout was the week’s most-watched sporting event, drawing 37.7 million total viewers and a 22.0 household rating.) Moreover, last night’s HUT levels were down nearly 30 percent when compared to that long-ago January night. For all that, many observers expected the Live Another Day premiere to at least match the deliveries of the Season 8 finale, which drew a 2.8 in the dollar demo. Despite not having any real dramatic competition, the two-hour episode lagged behind NBC’s The Voice by four-tenths of a ratings point. While a strong premiere is always a happy outcome, the trick is to keep the audience coming back for more. That increasingly has been a challenge for the broadcast networks, which continue to lose share to original cable series that manage to grow from week to week, season to season. And slippage can happen fast. In January 2012, Fox’s Touch (which also starred Kiefer Sutherland) arrived to a robust 12 million total viewers and a 3.9 in the dollar demo. By season’s end, Touch had crumpled to a 1.3 rating. More recently, The Following went from being the belle of the ball in 2012-13, averaging 7.95 million viewers and a broadcast-high 2.6 rating, to this season’s underwhelming 4.76 million/1.6. Live Another Day next week moves into its regular Monday 9 p.m. time slot behind Bones. As it happens, the second installment of the serialized drama will air while Fox is closing down its upfront after-party in Central Park.